Haven’t we all judged people before knowing them?Our attitudes and fears will always lead to the interpretations we hold in our minds when in reality situation on the ground could be very different from the way we think. Surprisingly Kakamega Governor Wycliffe Oparanya has testified that the handshake between President Uhuru Kenyatta and ODM Leader Raila Odinga has really changed the behaviour of the head of state. Oparanya claimed Uhuru has become more friendly and accommodative as compared to the period before the two leaders had a pact. Oparanya claimed he used to find it hard communicating with the president as he (Uhuru) could snub his his calls. “The handshake is the best thing that ever happened to us. Nowadays, Uhuru receives my call whenever I call him,” Oparanya said in a speech largely made in Luhya dialect. 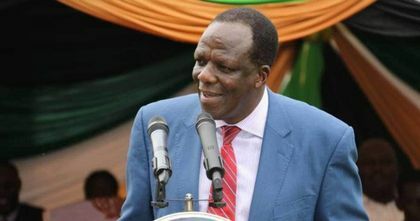 Political difference between the duo, Oparanya said, created animosity between the Ruling Party and ODM allied members. He claimed that Uhuru rarely received his call before as he (Uhuru) could wonder what a man from the Opposition Chief’s camp had to tell. “I think Uhuru would posed to himself and ask what a Raila allied leader wanted to tell him. The handshake, has really helped us. Currently, I do not have to hide for me to call him. We do out business in the open,” the county chief added. Political rifts between Uhuru and Raila deepened immediately after the August 8, 2017, General Election. Raila, who according to the IEBC, lost to Uhuru, protested the win in the Supreme Court citing massive polling irregularities. The Apex Court later Friday, September, 1, 2017, ruled that the election was null and void directing for a fresh polling exercise. The poll agency convened the repeat poll on October 26, 2017, but it largely ignored by the ODM camp. After the poll, Uhuru was declared winner and sworn in for the second term as president. Raila, later on January 30, 2018, swore himself in as People’s President thus brewing more bad blood between the two politicians. The period that ensued, drove a bigger wedge in the already existing wide rift as section of political elite claimed Raila had committed treason. On March 9, 2018, Uhuru and Raila met and set aside their differences and this launched the country on a reconciliation course. After the handshake, the Kakamega County boss claimed he even managed to approach the head of state and intimated to him that he (Oparanya) was interested in succeeding him. Oparanya said Uhuru informed to him him that he was fit to run for the top job. However, in the spirit of the handshake, Oparanya says Uhuru referred him to Raila for further consultation on the subject. “I spoke to Raila and he told me that he had no problem with my aspiration.